Naglieri Nonverbal Ability Test (NNAT) | All You Need To Know! 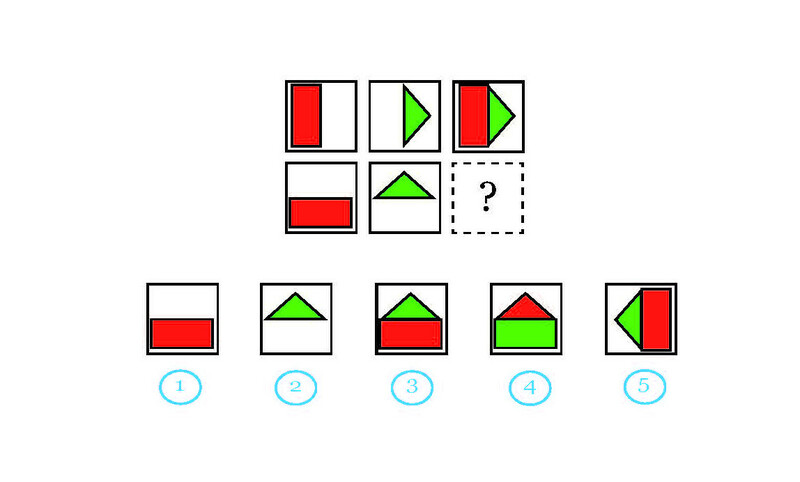 The Naglieri Nonverbal Ability Test (NNAT®) is a nonverbal measure of general ability in students between four and 18. So what is "general ability" exactly? General ability includes those abilities and skills that students use to solve problems with reasoning, memory, insights, verbal and math skills, patterning, sequencing and by making connections and inferences. In short, the NNAT® is designed to measure the abilities which predict academic success. The questions on the NNAT® consist of geometric figures, shapes, and symbols and a child must use visual reasoning and logical thinking to decipher the answers. The test does not require a child to be able to read, write or speak in the English Language. Keep in mind that just because the Naglieri test is described as a “nonverbal” measure, it does not mean that it measures ‘nonverbal’ skills. Rather, it is a nonverbal measure of cognitive ability and reasoning skills. The term “nonverbal” is a description of the way the kind of questions on the test -- not the kind of thinking needed to solve them. In fact, kids who do well on the test often use verbal strategies (talking themselves through the problem in their head) to reason through the question. The second edition of the Naglieri Nonverbal Ability Test – the NNAT®2 - is currently used as a 'gifted and talented' test to identify children from diverse linguistic and cultural populations for accelerated programs across the USA, including the NYC Gifted and Talented (G&T) program, and gifted programs in Texas and Virgina Beach. The NNAT is often given to prospective G&T students in conjunction with other tests that also measure reasoning skills, such as the Otis Lennon School Ability Test (OLSAT) and the Cognitive Abilities Test (COGAT). In addition to being used as a placement test for gifted and talented programs across the country, the NNAT®2 is often used in school settings to help teachers decide whether a child would benefit from advanced or remedial classes. The original NNAT test, released in 2004, consisted of 38 questions and was available only in paper and pencil format. The NNAT2, published in 2011, has 48 questions and offers both an online version and a paper and pencil test. This multiple-choice test takes approximately 30 minutes to complete, and is administered in a timed setting. Since the NNAT is used as a non-verbal assessment of cognitive ability, the test instructions are brief and available in different languages. 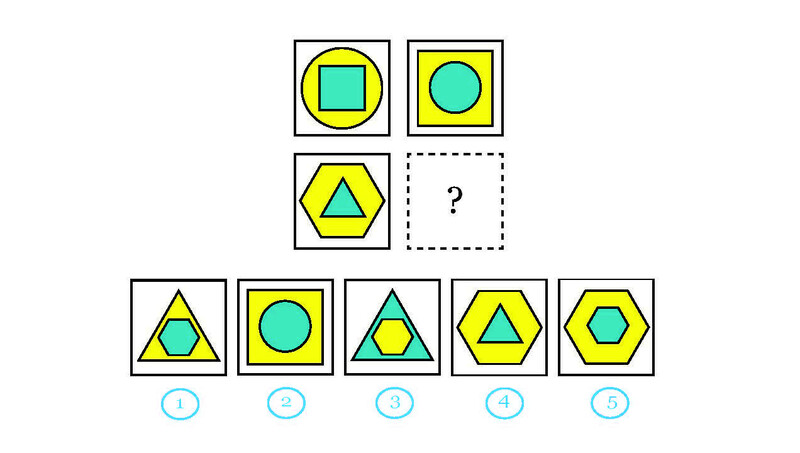 The object and shapes in the questions are presented in only two colors – blue and yellow. The NNAT®2 is comprised of four main sections or ‘question’ types. The student is presented with a picture of a matrix. The student must observe and detect the relationship among the parts of the matrix. The student must solve the problem based on the information shown to her within the matrix. The student must choose the correct answer from a selection of five possible answers options. The chart below describes the four question types and the associated skills the child needs to perform in response to each question type. There are seven different test levels (A-G) designed for students in kindergarten through 12th grade. Students take the exam level appropriate to their current grade. Adjustments are made in each test to fit the learning level. Three levels (A-C) are targeted for children in Kindergarten through Grade 2, reflecting the fast cognitive growth in kids of this age group. Another level (D) was created for children in 3rd and 4th Grades and the E level is targeted at 5th and 6th graders. The F level serves middle school and junior high students (7th, 8th and 9th grades). The highest level (G) is for students in 10th, 11th and 12 grades. Below are some sample questions that you might find on the Level A and B tests. With this question type, the child is presented with a design in a rectangle. Inside the large rectangle is a smaller white rectangle representing a missing piece that completes the design. 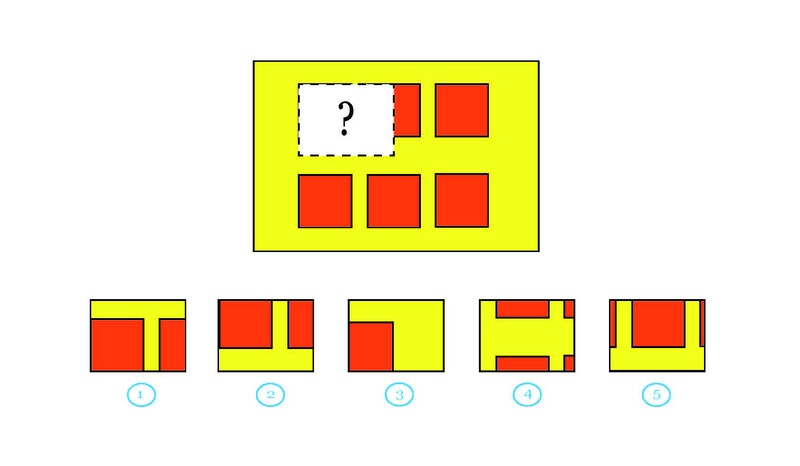 The child must choose the answer that best fits the inner rectangle so that the missing parts complete the design. These questions are the most common question types found on NNAT tests for Kindergartners and 1st grade level students because they are the easiest kind of matrix on the exam. 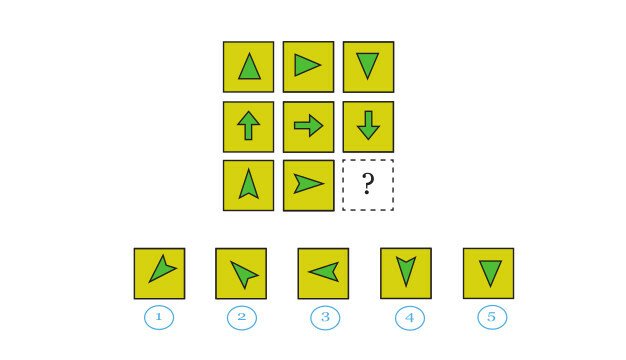 With this question type, the child is presented with a matrix of 4-6 boxes containing objects, usually geometric shapes. The child must first recognize a relationship between these objects. The object in the first row, first column is related to the object next to it (in the first row, second column) in the same way that the object in the second row, first column is related to the object that should go in the empty box next to it (in the second row, second column). If there is another row, then the relationship between the objects in the rows above continue to determine the relationship between the objects in the third row. To solve the problem, the child must determine how the object changes as it moves across the row and down the column in the matrix. The question may require that the student pay close attention to several aspects of the design (e.g: shading, color, shape) at the same time. These questions require the child to understand how the objects in rows and columns relate to each other. The child must isolate and apply the rule/s in order to identify which object from the answer choices fits the empty box in the bottom right-hand corner of the matrix. With this question type, a child is presented with a series of objects that combine, invert, transform and/or rotate across rows and columns. The child must identify the rule for the top row of objects and then predict what will happen to objects in the second (or third) row. She must then select which object among the answer choices follows this rule and should go in the empty box in the matrix. 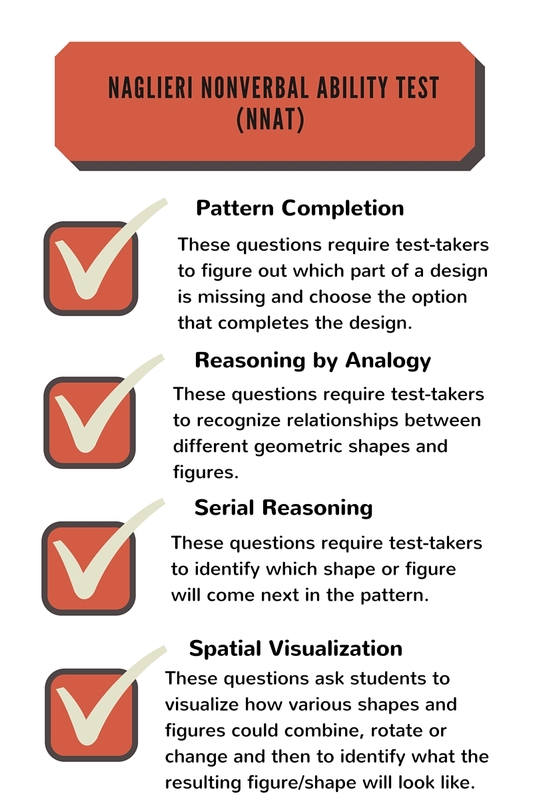 Spatial Visualization items are widely seen to be the most difficult items on the test, particularly when involving objects that connect in ways that are hard to recognize or involve an object rotating. Only a few of these questions will be presented on NNAT lower levels (A-B) exams. Would you like to help your child prepare for the NNAT2 with our "Teaching Tips Cheatsheet"? Click the button below to download this free resource, which includes teaching tips and strategies specific to each question type. A NNAT®2 score provides an assessment of a student’s general reasoning ability compared to peers in the same age range. A student’s NNAT®2 score is calculated by first turning the raw score into a score on the Naglieri Ability Index (NAI). The raw score is defined as the student’s total number of correct answers. For example, the raw score would be “38” if 38 questions were answered correctly out of a total 48 questions. The NAI score provides more information than the raw score because it highlights a student’s overall ability score compared to other students (in the same three-month age band) who took the test at the same time. A percentile rank of 50 means the student got as many questions right as a child who got a NAI score of 100. It also does not indicate that the student only got half the questions correct. What Do NNAT2 Scores Mean? The NAI score has a mean of 100 regardless of the age of the student or which form of the test they took. That means that the average score for a student of any age is 100. The majority of kids achieve an average score falling somewhere between 90 and 110. Fewer children reach a score between 111-130, which is labeled as high average ability (111-119) or superior ability (120- 130). A tiny number (top 2.5%) of children achieve a score higher than 130. 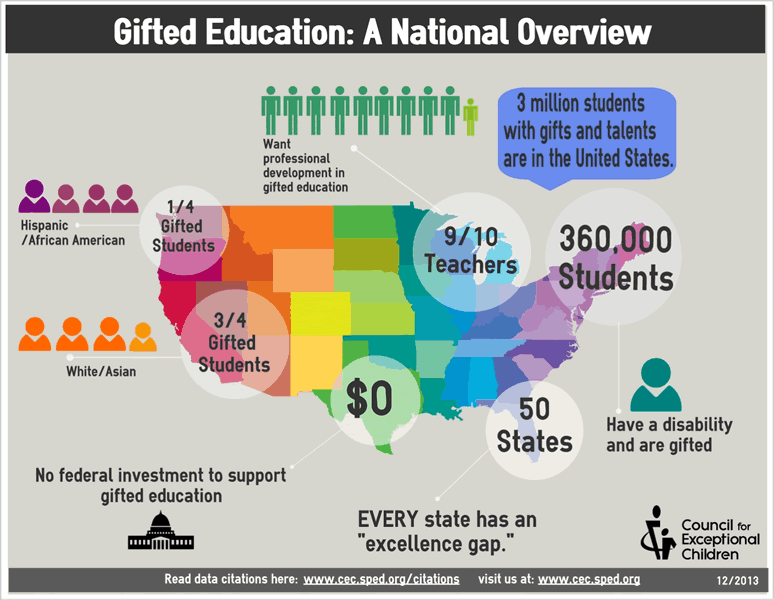 The National Association for Gifted Children (NAGF) estimates that approximately 6% of the student population are in gifted programs across the country (about 3 million kids). In recent years, traditional IQ tests have been criticized because of test bias, as well as because of their reliance on knowledge versus innate ability. These flaws mean that IQ tests do not always capture accurately the general ability of those children who may not have academic skills or who are not proficient in the English language, but who are still very intelligent and could benefit greatly from gifted or advanced programs. The NNAT® is preferred by some educators because it is considered to be “culturally neutral” and can better identify these children. The Naglieri test is a useful screening exam in this sense because it can highlight the abilities of children who were not exposed previous education in the home. Each question on the NNAT test contains all of the information needed to solve it: a student does not need to have other knowledge that would help him or her pick the correct answer. Because the NNAT uses nonverbal stimuli and questions to measure intelligence, it is also a popular tool to assess cognitive ability in a student with a learning disorder or disability like deafness. The exam’s use of only two colors (blue and yellow) is particularly useful for testing students with color-impaired vision. One criticism of the test is that the NNAT score represents just one measure of intelligence as it lacks a verbal element. If "IQ" represents a range of skills, then a test that assesses a smaller range of those skills and abilities is going to only identify (according to this perspective) those students who have the matching skills for which the NNAT tests. In addition, like many other standardized IQ tests, the NNAT tells us only about the intellectual domain, but does not consider other abilities in the creative, leadership realm or other intelligences such as emotional or kinesthetic intelligence. It is also widely understood that it is difficult to assess the IQ quotient of a young child under 8 in the basis of a test. Because of this, many programs and schools also use other assessments of giftedness including additional assessments, parent reviews, teacher surveys, interviews, and observation play-dates. Who created the NNAT TEST? The author of the test, Jack A. Naglieri, is an educator and psychologist, whose work over thirty years has focused on researching theoretical and psychometric issues concerning intelligence, cognitive interventions, executive function and resilience. 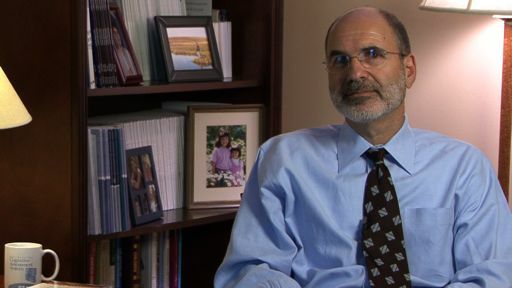 During the course of his career, Naglieri has authored hundreds of scholarly publications, including papers, books, and cognitive assessment tests. He is currently a researcher and professor at the University of Virginia, and at the Devereux Center for Resilient Children at George Mason University. Firstly, and most important, we recommend committing to making the test preparation process a stress-free one. This is particulalry true if you are a parent and you are helping a young child prepare. Helping your child keep calm and focused in the face of challenge is a quality that will follow him throughout his academic years. Also, be prepared for difficult questions from the get go! There will be a certain percentage of questions that are very challenging for all kids taking the test. It is key to encourage your child to use all the strategies available to him or her when faced with one of these more difficult questions. And realize that your kid can get quite a few of the test questions wrong and still do very well overall. As to when to start preparing, we suggest students, at minimum, take one practice test and spend a minimum of 8-10 hours working through NNAT-type questions. As they say, knowledge is power! Preparing for the NNAT test will certainly help your child avoid anxiety and make sure she does not give up too soon when faced with unfamiliar and perplexing questions. If your child is challenged by a question, ask questions to help guide her to the correct answer, and always provide positive reinforcement. Ask your child to explain why she chose a specific answer. If his answer is incorrect, this will help you both identify where he is stumbling. If his answer is correct, ask him verbalize his reasoning so to help reinforce the concept he has learned. Encourage your child to carefully consider all the answer options before selecting one. If your child is stumped by a question, she can use the process of elimination. Firstly, eliminate obviously wrong answers in order to narrow down the answer choices. If still in doubt after using this technique, she should make a guess as there are no points deducted for wrong answers. Encourage your child to visualize what the correct answer in the empty box before checking the answer options. The Naglieri Nonverbal Ability Test (NNAT®) is a registered trademark of NCS Pearson Inc, and is not affiliated with Origins Tutoring in any way.